This & That, a set on Flickr. One nuclear reactor generating about 1GW of electricity per year requires about 1 sqkm of space, including the facility, and a safety zone. It provides electricity for 700,000 people (assuming 13,000kwh per year per capita). To generate the same electricity, you need at LEAST 4,375 wind turbines, and an area of 325 sqkm. That’s assuming some very idealistic factors about capacity factors and availability. The more wind you have in the system, the more windmills you actually need per unit of energy required. Let’s assume 320 million Americans: you will need at least 460GW electricity per year. If you were to provide that electricity exclusively from wind, you would need about 12.7 million turbines, and 952,000 sqkm of wind farm (the capacity factor at this rate of wind penetration needs to be at least 25, probably more, but let’s be generous) – about 10% of the total land area of the United States. Or an area almost 30% as large as India. The material requirement for each of these turbines in terms of concrete, steel, rare earth metals (for the generators), the amount of roadways for this wind farm, the amount of labor, supplies, etc. etc. to keep the farms in good shape and updated is absolutely staggering. I don’t have the numbers for that, unfortunately. IF you were to provide the entire supply of electricity with nuclear reactors, you would need approximately 700 reactors at 1 GW each. Space requirement: approximately 800 sqkm – less than 1% of what is needed for wind. You would also need orders of magnitude less supplies, infrastructure, or labor. Let’s assume a 1GW nuclear reactor costs about $2.5 bln, or $2.5Mln for each installed MW. Total cost: $1.4 trillion. About 8.4% of what the wind project would cost. Anybody still think wind makes sense? I think I have made up my mind about Tree of Life – it’s a good movie. I’m not sure yet that it is a Great Movie, but it certainly is a Good Movie. It’s visually beautiful. And from what I have read, that beauty was accomplished with almost no CGI, except for one scene involving dinosaurs, and even that somehow managed not to be stupid (I can’t think of a movie with dinosaurs that wasn’t laughable). There is almost no dialogue. Some of the best scenes don’t involve any words at all. The torrent of mixed emotions and confusing thoughts running through the head of a young boy as he seriously contemplates murdering his own father is conveyed by nothing more than effective framing and to the point facial expressions. The traumatizing breach of trust between two brothers is beautifully foreshadowed and then realized without a single word being spoken. The visual metaphors are clear, but not heavy-handed. Malick is not beyond using conventional movie tools, but in his hands they do not feel cheap and manipulative. The soft light of the scenes set in the protagonists memories make sense, conveying not so much the wistful adulation of the past, as they are meant to underline the uncertain reliability of childhood memories. Flashbacks are too often an easy cheat for mediocre storytellers who cannot think of a better way to flesh out the inner life of the protagonist. But Malick doesn’t use flashbacks to explain the actions of his protagonist in the present. Jack’s adult self (Sean Penn), whose childhood is at the narrative heart of what little there is of a story, doesn’t do much more than ride up and down an elevator, walk into a meeting, talk on his cellphone, and look at a tree between towering high-rises. The banality of the present day in The Tree of Life is probably not accidental – all the drama, tension, and even beauty seems to be part of our past, and rather than being a precise recollection is more the result of personal myth-making. It is unlikely that Mrs. Obrien (Jack’s mother, played very beautifully by Jessica Chastain) was as quiet or demure as Jack remembers. At least one of his memories show that she was quite capable of standing up to Jack’s father (Brad Pitt), though Jack can’t hear what they are saying to each other, and seems not too interested in finding out. As if children ever really care why their parents are fighting – it’s not what matters to them. The most curious scene of all comes towards the end, and here Malick is far less clear as to where reality ends and imagination begins. Are we witnessing Malick’s personal vision of life after death? Is Jack simply allowing his thoughts to drift into the weird fantasy world where everything that’s bad is washed away, and while hardly a plausible paradise, it nonetheless provides some kind of wistful comfort? Since Malicks timing is so spot-on throughout the film, the overlong, overly repetitive structure of that scene cannot have been a slip of judgement. I’m not entirely sure what it was meant to convey, but maybe that will reveal itself on a second viewing. The end of the film neatly closes the visual circle, with glorious imagery and beautiful sounds. Life will end, eventually. Our species will pass away somehow – just like the dinosaurs before us. Strangely enough, it does not feel depressing at all, at least not to me, and I generally resent this particular aspect of reality. Instead, it feels alright. Just the way it should be, and not because humanity is damned and deserves no better, but simply because that’s the way it is. What’s also quite surprising about the Tree of Life is the music. Music is normally the bane of movies. Too often, it points out the obvious. Weeping strings when one should be sad, pounding bass when one should be tense, shrill disharmonies when one should be afraid. Most directors seem not to have enough faith in either their directing abilities or the intelligence of their audience to let the logic of the story and what is on the screen determine the emotional response. Yes, music is necessary to set the mood – that’s just how our emotions seem to work – but like soy sauce on sushi, there is a point at which it becomes too much and assaults our senses, rather than stimulate them. The music in Tree of Life is big. It’s powerful, it’s dramatic, it’s emotional. But oddly enough, it never feels too much. It works with the images on the screen, and even thought it is often very loud, it always feels just right. And in a few brilliant scenes, the music tells the story in harmony with the images and actions of the people we observe. I can’t think of many directors who have been able to work with music as effectively as Malick does in Tree of Life. Maybe Leone or Kubrick, but to compare Malick’s use of music in Tree of Life to either of them does injustice to all. And as for commentators who compare Malick’s cinematography and narrative ambition to Kubrick, they are right at a technical level, but it should be pointed out that there is none of Kubrick’s vicious sneer and contempt towards humanity to be found in Tree of Life. If anything, Tree of Life may be an inadvertent rebuke to the philosophy of Kubrick: yes, life is short and cosmically futile, but it does not necessarily have to be empty and obscene. Instead, it can be beautiful. A few weeks ago there was some minor media storm over a study claiming that High Fructose Corn Syrup is some kind of super food for cancer cells. A group of researchers in the US had taken cancerous pancreatic cells and fed them both fructose and glucose to see which one of these two types of sugar was a more effective nutrient for the cancer cells. The results were somewhat interesting in that pancreatic cancer cells seemed to grow and – more importantly perhaps – multiply faster on a fructose than on a glucose diet. In fact, some metabolic processes took place 120 – 150 percent faster when the cells were provided pure fructose rather than pure glucose. Those who have a sufficiently strong technical bent can read the study themselves. Therefore, fructose is a particularly significant dietary sugar component with important implications for patients with cancer, particularly given the significant dietary change that has occurred in human fructose consumption since the mid- 20th century. Our findings provide important insights into recent epidemiologic studies that have identified refined fructose as an independent risk factor for pancreatic cancer, and identify fructose-mediated actions as a novel therapeutic cancer target. What they are getting at is this: since the middle of the 20th century, so-called high-fructose corn syrup (HFCS) has become one of the most important industrial sugars in the United States (less so elsewhere, mostly because the use of HFCS in lieu of other sugars is a particular artefact of American agricultural policy). And for quite some time, food activists and nutritionists of varying credibility have claimed that HFCS is a particular horrid type of sugar that’s responsible for pretty much every human health problem under the sun (except those caused by meat, of course). But so far, there has been very little proof that HFCS is indeed particularly bad for humans health – for all we know so far, HFCS is nutritionally pretty much indistinguishable from honey or maple syrup, and humans have been eating these for quite a long time. While HFCS may indeed be bad for our health, there is no reason to believe that is worse than honey, maple syrup, or the sugar contained in fruits (which is mostly fructose, by the way). "I think this paper has a lot of public health implications. Hopefully, at the federal level there will be some effort to step back on the amount of high fructose corn syrup in our diets"
U.S. consumption of high fructose corn syrup went up 1,000 percent between 1970 and 1990, researchers reported in 2004 in the American Journal of Clinical Nutrition. Yes, it’s only one particular type of cancer – but it’s precisely the type of cancer the group has been studying, and considering how radically different various types of cancer are in their metabolism and pathology, it’s not really good science to assume that just because something happens in the case of pancreatic cancer cells that it would also happen in the case of, say, endometrial cancer. So – if Heaney’s team is right that fructose is a particularly potent food for pancreatic cancer cells, and if the consumption of fructose has really gone up by an entire order of magnitude over the last forty years, then it stands to reason that pancreatic cancer rates should have gone up significantly. 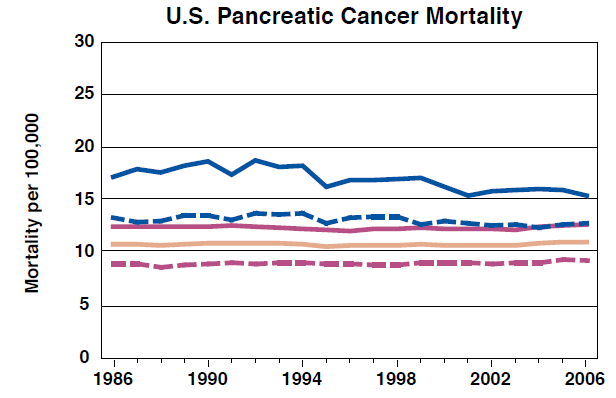 Unfortunately, overall pancreatic cancer incidence and mortality rates have changed very little throughout the past three decades. Yet, there is no such epidemiological riddle. 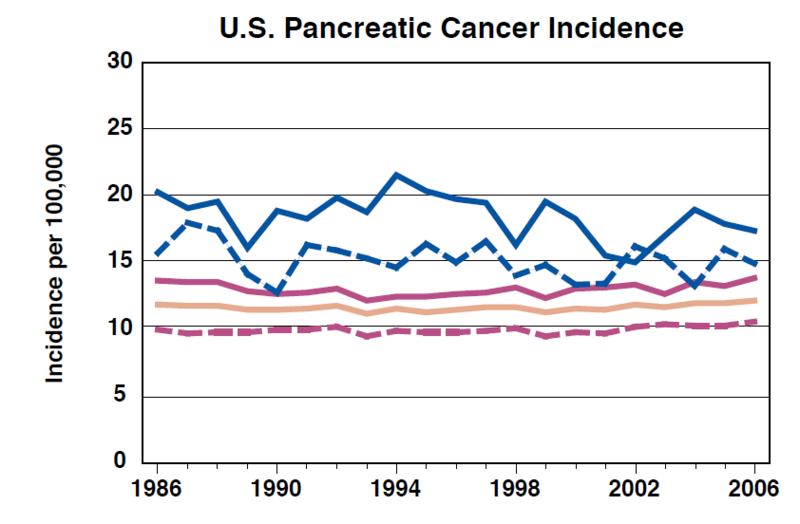 There is in fact nothing really interesting going on in the epidemiology of pancreatic cancer (other than the fact that African American males have more of it than White males). Increased obesity due to increased total energy consumption and reduced activity now contributes to 15% of U.S. cancer deaths. […] In addition to higher fat intake, a large increase in refined carbohydrate intake has occurred, which itself has been hypothesized to be a risk factor for several cancers. Calle EE, Thun MJ. Obesity and cancer. Oncogene 2004;23: 6365–78. Kaaks R, Lukanova A. Effects of weight control and physical activity Kaaks R, Lukanova A. Effects of weight control and physical activity. Ann N Y Acad Sci 2002;963:268–81. My curiosity tweaked, I read the studies myself – and found something rather very odd: neither study as much as mentions carbohydrates, never mind refined carbohydrates. I kid you not: not a single mention of carbohydrates, refined or otherwise, in either the Calle and Thun, or the Kaaks and Lukanova paper. Not even the word sugar or starch is mentioned in either. Both papers discuss in great detail how overweight has been found to contribute significantly to various forms of cancer. Neither discusses in any significant detail the role of different nutrients. In this case it’s really not necessary to have an advanced degree in science to recognize that it is not good science to claim that some studies have drawn a link between carbohydrates and cancer when these studies do not even discuss carbohydrates in passing. Not good science at all. Larsson SC, Bergkvist L, Wolk A. Consumption of sugar and sugarsweetened foods and the risk of pancreatic cancer in a prospective study. Am J Clin Nutr 2006;84:1171–6. Very interesting indeed, and they promptly find exactly such a link. But – what does this have to do with the different metabolization of glucose and fructose by pancreatic cancer cells? Results of this US prospective study may not be directly comparable with the results in the current study, however, because sucrose is the sugar added as a caloric sweetener to soft drinks in Sweden, whereas high-fructose corn syrup is the major source of caloric sweeteners in soft drinks in the United States. Sucrose. Not fructose. Never mind that sucrose is eventually broken down into fructose and glucose in the body before it is delivered as food to the various cells, carcinogenic or otherwise. The point here is that Healey et. al. are trying to show that high-fructose corn syrup is a contributing factor to pancreatic cancer based on a study that explicitly points out that it does not deal with high-fructose corn syrup, but sucrose. Very different. At this point I did not expect too much from looking at the Michaud study. But it turned out to be a little better than the others: Michaud et. al. did indeed find a link between fructose intake and elevated risk of pancreatic cancer – among overweight women, particularly those who engaged in little physical activity. The link was not found among lean women who were physically active. The study did not include men (not because Michaud et. al. are sexist, but because the 1976 Nurses’ Health Study did not include men). Have there been such studies since 2002? Possibly, but nothing decisive – at least not based on the citations included by Heaney et. al. There is plenty of discussion on the way cancer cells metabolise fructose, but the critical question of how fructose contributes to carcinogenesis is not addressed. But if we do not know whether or not fructose is is a more important factor in carcinogenesis than other types of sugar, there is little point in discussing whether or not the consumption of high-fructose corn syrup should be reduced. Besides, there’s plenty of fructose in foods not made with HFCS. Even removing fructose from all foods would not make a difference since sucrose is broken down into fructose and glucose in the body, since our cells do not use sucrose. As far as I’m concerned, the findings by Heaney et. al. have interesting implications for the treatment of pancreatic cancer – but in terms of epidemiology, they are likely meaningless. That’s not really a shocker, though, since in-vitro studies on pretty much anything are rarely of great epidemiological significance. They can be – but they rarely are. The real shocker, however, is the absolutely dismal level of scientific integrity in this paper. It is hard to swallow that a paper that misrepresents its sources to such a degree made it through the peer review process at a major international cancer research journal. And it is completely beyond the pale that the authors of this paper had the audacity to go to the media with grandiose claims about the dangers of high-fructose corn syrup to the general population when there’s almost nothing in their paper to actually support this claim. What are these people thinking, and what exactly is it they are trying to achieve? Because if their goal is good science, then they have clearly failed.